Update: Jeff is going on 4 years at the shelter now. Let’s help him find his family! Jeff is a 7 year old Jack Russell Terrier Mix, 3 yr shelter resident at the Gateway Humane Society, in Fallscreek, PA.
Meet Jeff, what a cutie he is. He is a 7 year old Jack Russell Terrier Mix, who has been waiting three long years at the Gateway Humane Society in Fallscreek, PA.
Jeff is a shy guy, who needs a lot of coaxing to come out of his shell. But once he does he is very affectionate and loves to cuddle. The special family that adopts Jeff will need to be experienced dog owners, with no other dogs and no small children. But once they win him over will have a wonderful little boy with a lot of energy. Could you be the special family Jeff is looking for? 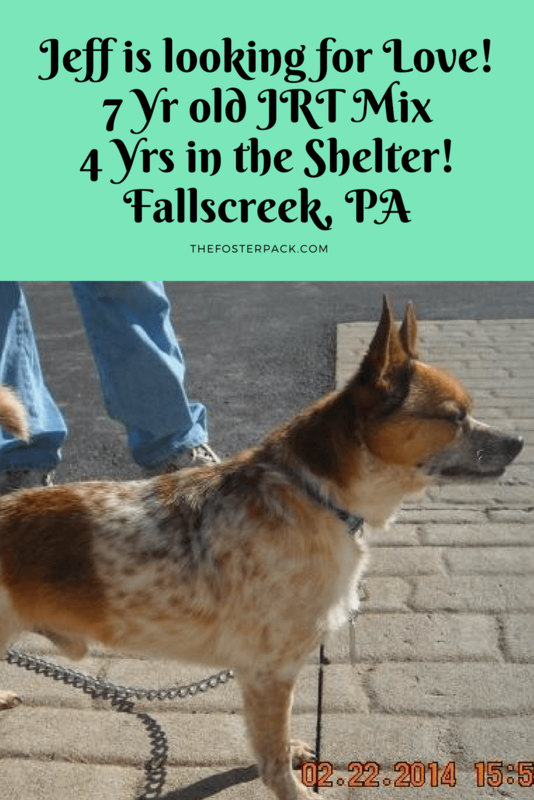 So here is our first post to get some of these long term shelter dogs adopt. I’m hoping to turn it into a regular series. So if your shelter, or animal rescue has some long term shelter animals email us at: mamaminion @ thisdomain and we’ll do a write up on them too! The End of an Era: The Tater Tots have left the building.